The Directors of Health Promotion and Education (DHPE) produced three #Choose2BHealthy public service announcements (PSAs) about the WIC’s Farmers' Market Nutrition Program featuring Crescent City WIC Services. These PSAs highlight how Farmers' Markets provide fresh fruits and vegetables resources for mothers of young children; stimulate local economies through retail revenue; and support local communities by fostering community partnerships and clinical linkages. “These PSA's are helpful tools for informing the public about fresh food resources,” said Thometta Cozart, MS, MPH, CPH, CHES, DHPE Assistant Health Equity Director and #Partnering4Health Communications Manager. National Farmers Market Week, August 6-12, is an annual celebration sponsored by the United States Department of Agriculture to emphasize the important role farmers’ markets play in the nation’s food system. As a by-product, farmers’ markets stimulate local economies both great and small. For every $100 spent at a farmer’s market, $62 stays in the local economy, and $99 stays in state. The CDC’s National Implementation and Dissemination to Prevent Chronic Disease or #Partnering4Health Project brought together the Directors of Health Promotion and Education (DHPE) and the National Women, Infant and Children (WIC) Association to promote healthy eating choices for women and their families to prevent chronic disease nationwide. Through WIC’s Farmers’ Market Nutrition Program, one of WIC’s first #Partnering4Health sub-grantees the Crescent City WIC in Gretna, LA helped local farmers become certified to accept WIC and/or SNAP. Crescent City WIC also offered $20 worth of coupons to families to spend at the markets and provided healthy eating classes for children so they will be more receptive to the vegetables purchased at farmers’ markets. As part of the CDC #Partnering4Health Project, DHPE produced three #Choose2BHealthy public service announcements (PSAs) about the WIC’s Farmers' Market Nutrition Program. The production of these videos entailed DHPE working with Crescent City WIC Services to shoot video of the farmers’ markets, interviewing local farmers from Ben & Ben Becnel’s Market, Audubon Nature Institute program partners, and Crescent City WIC staff. The result is three PSA videos of various lengths that emphasize different aspects of WIC Farmers Market Program. This PSA informs the public that their local WIC program can give expectant and mothers of young children access to fresh fruits & vegetables, which is also important to chronic disease prevention. The video promotes the use of local farmers’ markets as a means to support the local economy by keeping the money within the community. Eat Right – Long Life #Choose2BHealthy PSA, 1 minute, 45 sec. This slightly longer version of the PSA places an emphasis on WIC nutrition education programs and introducing children to healthy eating in order to protect them from childhood obesity and developing chronic diseases later in life. This PSA is a best practices example of the community partnership between the Crescent City WIC, Ben & Ben Becnel’s Farmers Market, and the Audubon Nature Institute. Through multiple interviews, the motivation and means by which the partners cross-pollinate their audiences to help each other grow is highlighted in this video. Communicate your intent to utilize the PSA videos by completing this online form: http://bit.ly/PSAInterestForm. And, please include #Partnering4Health in your social media posts. More than 3,390 markets nationwide accept Women, Infant and Children (WIC) Farmers Market Nutrition Program vouchers and 4,590 markets participate in the Senior Farmers Market Nutrition Program (SFMNP). At the Crescent City Farmers Market, 32% of market shoppers spend money at nearby businesses, resulting in $3.2 million in projected gross receipts and an annual contribution of $151,621 to local sales tax revenue. 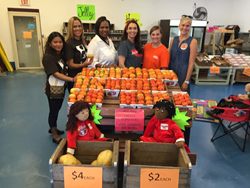 The Crescent City WIC Program is a small community-based nonprofit organization that has had a tremendous impact on its local and neighboring communities. For the past 40 years, it has nurtured healthy families by supporting pregnant, breastfeeding and postpartum women, as well as infants and children up to the age of 5, with nutrition education and referrals to other health and social services. “Crescent City WIC is an excellent example of the effectiveness of the Farmers’ Market Nutrition Program and how community partnerships can make healthy living easier where people live, learn, work, and play,” said Cozart. For more information about Crescent City WIC Services, contact Executive Director Mary Schultheis, (504) 247-0592 or http://www.ccwic.org. DHPE is a partner in the National Implementation and Dissemination for Chronic Disease Prevention nationwide project. There are 97 funded projects in communities across the nation assisting people and communities in living healthier lives, such as establishing farmers’ markets in local communities to increase access to fresh fruits and vegetables. For more information, contact Thometta Cozart, MS, MPH, CPH, CHES, Assistant Health Equity Director and Communications Manager, the Directors of Health Promotion and Education at tcozart(at)dhpe(dot)org. For media inquiries, call Leris Bernard, LGB Productions, 202.234-0312 or email leris(at)lgbproductions(dot)com. The Directors of Health Promotion and Education (DHPE) is a national non-profit organization whose mission is to build on principles and practices of health promotion and education to strengthen public health capacity in policy and systems change, thereby improving the health of all and achieving health equity. DHPE, founded in 1946, is legally known as the Association of State and Territorial Directors of Health Promotion and Public Health Education (ASTDHPPHE). DHPE is located at 1030 15th Street NW, #275, Washington, DC 20005. For more information, visit http://www.dhpe.org.